(l-r) Cardi B attends as Harper’s BAZAAR Celebrates ‘ICONS By Carine Roitfeld’ at the Plaza Hotel on September 7, 2018 in New York City. 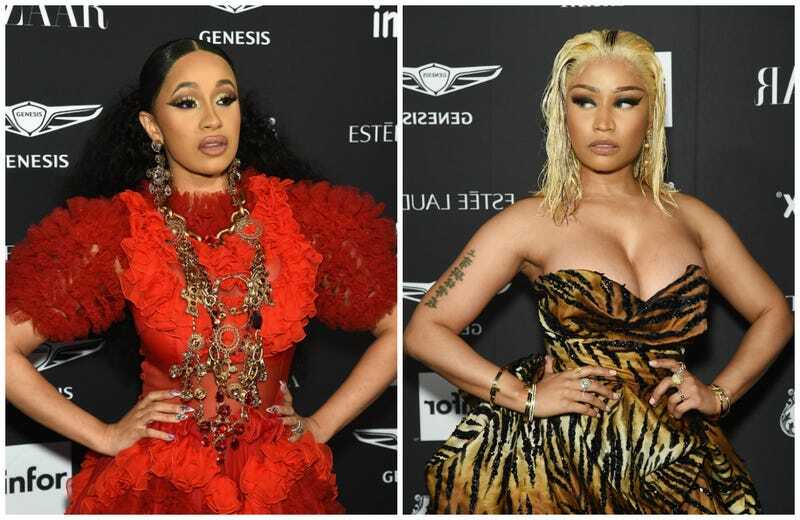 Updated: 9/8/18, 2:12 p.m. EDT: A insider from the Harper’s Bazaar party told Marie Claire that the altercation was sparked when Nicki (whom, according to Cosmopolitan, was taking a photo with Kelly Rowland and La La Anthony), deliberately stepped on the train of Cardi’s dress, ripping it. Cardi then purportedly confronted Nicki for talking about baby Kulture, and a scuffle soon ensued in which a portion of Cardi’s wig was ripped off before the two were separated by their entourages, at which point Cardi removed her shoe to throw it at Nicki. Earlier: Couture was not created for this. New York Fashion Week is officially in full swing—and swings were apparently taken Friday night at the Harper’s Bazaar ICONS by Carine Roitfeld party at the Plaza Hotel in New York City, when long-brewing tensions between Cardi B and Nicki Minaj finally boiled over—all over their custom-made ballgowns, that is. There are conflicting reports on whether the target of Cardi’s ire was Nicki Minaj herself or entourage member Rah Ali, but the incident was reportedly instigated by comments made about Cardi’s infant daughter Kulture and Cardi’s mothering skills. Yeah ... last time I checked, them is fighting words. People connected to Cardi tell us, when Cardi approached the table she was not looking for a fight ... they say she wanted “to address the lies Nicki was spreading.” They believe security had a plan if Cardi came anywhere near, and one of them elbowed her in her face (check out the lump). They say at that point it was on. Cardi, true to her code in an all-red gown by Dolce & Gabbana, wasn’t wearing Louboutins on Friday night, but was clearly ready to turn her red leather platform heels into “bloody shoes” (literally), reportedly throwing one at the offending party as Nicki was buffeted by her security detail. After the Plaza’s security intervened, Cardi and her entourage were whisked out of the event; Cardi with an already pronounced knot above her left eyebrow and without her shoes. Nicki Minaj departed soon after in typically over-the-top fashion, preening for the cameras and gleefully showing onlookers that she was leaving the event with both her stilettos firmly attached to her feet. Real talk? We wish Cardi hadn’t given Nicki the satisfaction—or the fashion set another reason not to include the community on future invite lists (as if). But the end of the altercation was only the beginning for the “Bartier Cardi” singer, who immediately took to the ‘gram to explain exactly how the tension had mounted, and why she’d exploded in such a public manner. And while we joke about not being invited to future fetes, #neverforget that we’ve been at this particular rodeo before—and all parties were in attendance the following year. All we know is that the Harper’s Bazaar ICONS event will never be the same—and that as far as Twitter’s concerned, Nicki’s still #2. Oh, yeah—there was a whole gang of other famous and super-fashionable folks in fancy clothes there, too. In fact, this post was originally supposed to be about them. But I guess it’s not a celebrity event unless someone gets upstaged.